We live in the age where people are always on the go and they want their technology to be with them no matter where they are. This is why Smartphones and tablets are so popular and it gives us a good idea of what 2013 web design trends we will see now and in the future. With so much advanced technology at our fingertips, web designers everywhere are anxious to discover how new techniques for web browsing will affect web design. Since mobility is so important to consumers today, it should be safe to say that the future of web design will focus on this, as well. Designers will need to create web designs that are both user friendly and more compatible with mobile devices. They’ll also have to be eye-catching and impressive to grab the attention of today’s users. Considering this, here are a few ideas of what 2013 web design trends should bring. Integrating an easy way to access social media networks into the web design is a new trend for 2013. Social media is constantly growing in popularity and this trend is not likely to change. Therefore, it makes sense that making these sites more accessible through web design would be beneficial because it makes it possible for users to access their favorite social networking site right from your website. 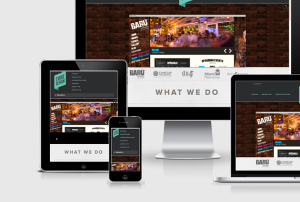 Responsive web design is not new but this trend was so successful in 2012, it’s not going away anytime soon. This design is what makes it possible for websites to adjust to the different screen sizes and resolutions, so users can view them on mobile devices as well as computer screens. Websites look better and they’re easier to read on all devices when this layout is used and since the introduction of HTML 5, responsive web design layouts are even more effective and look better than ever. Hypertext markup language 5 is capable of making animations with two-dimensional graphics. This makes it easy to create more fun and interesting layouts, so you can expect that it will eventually take the place of Adobe Flash in 2013 web design trends. You can expect parallax scrolling to gain lots of attention in 2013 because it gives more depth to the images. It makes the 2D objects seem more like 3D because designers place them on different layers. Parallax scrolling allows these designs to move in the same direction using different speeds. Vertical scrolling is growing in popularity because it’s more user-friendly and convenient for mobile users. When you combine parallax scrolling with vertical scrolling, it creates an interactive visual design that is interesting, easy to navigate and more enjoyable to look at. At this time, it is easier and more convenient for mobile users to browse the web through applications, especially if they are accessing social media networks or Google+. You can expect to see this trend continue throughout 2013. While there is no way to know for sure what more 2013 web design trends will bring, we do know what gets attention and what users like to see. This information gives us a good idea of what to expect. One thing is for sure, you can expect 2013 to be more exciting and interesting than anything we have seen before.